In May 2015, immediately following a lawful article I wrote about corrupt Duvall police officer, Lori Batiot filed a petition for restraining order, written by John E. Pennington, terminated Director of Emergency Management ( only after he killed 43 people in the Oso mudslides), and his bank frauding wife Crystal Hill Pennington ( nee. Berg, convicted of bank fraud in Snohomish County, WA, 2005, bank fraud in North Carolina using an alias of Chris Hill, 2000). About one month ago, a source inside the City of Brier called to inform us that Lori Batiot and John Pennington’s relationship was sexual while John Pennington was appointed to FEMA Region X in 2001. Batiot and Pennington met while she worked as coffee barista in Bellingham Washington, and when John Pennington owned a coffee delivery company , a source said. We have a lot more on their personal relationship, but since a child is involved, we’re not going to post what we know. But let’s just say, over 1.5 years later, we now know why the City of Duvall hired a corrupt police officer. 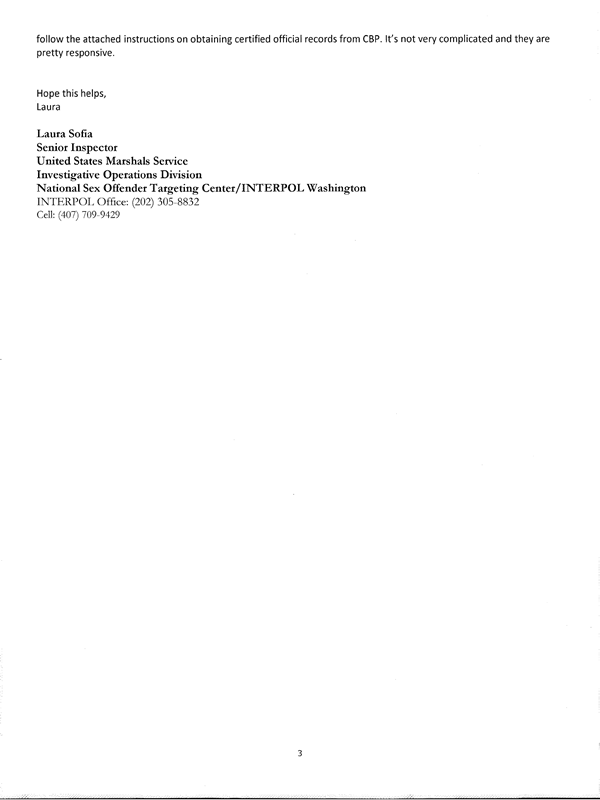 Remember, Lori Batiot was fired for drunk driving, fired from two police departments for conduct unbecoming of a police officer, failed a state mental health evaluation, and is guilty of countless episodes of unlawful and unbecoming police conduct, in the same town where John E. Pennington resides, Duvall Washington. 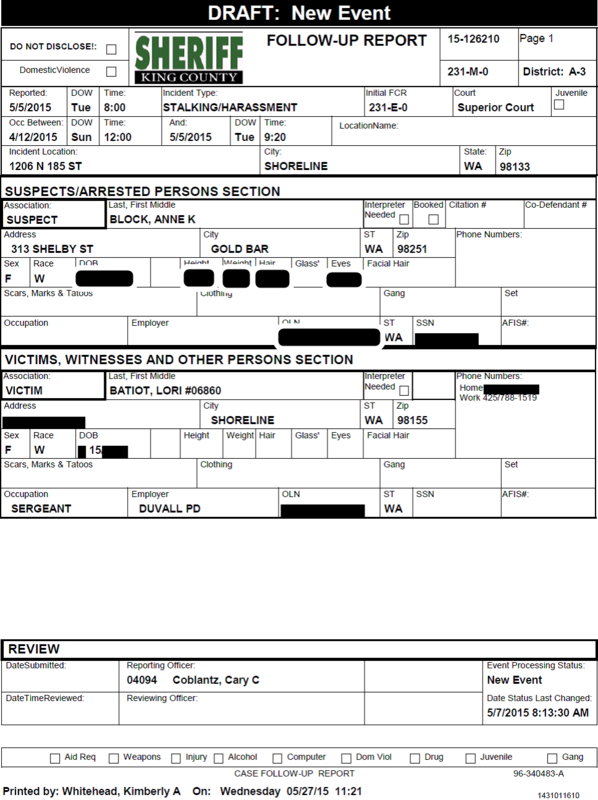 Lori Batiot is now on Washington State’s Brady Cop list. Brady cops are known liars. As an award winning journalist, I request access to public records, but only after receiving tips or as my mother trained us kids so well to do, pay attention to your intuition. ” If it quacks like a duck, it’s probably a duck.” My mother and father’s training has enabled me to foresee the future before it even happens. In May 2015, corrupt police officer Lori Batiot, connected to two other corrupt officials here in Washington, John Pennington and Crystal Hill, conspired to have me charged with cyber stalking over my style of news reporting. Perhaps as non-lawyers, not trained in constitutional law, they never understood that once they thrust themselves into the limelight, as the Honorable Supreme Court Justice Anthony Scalia held in Referendum 71, they became subject to public scrutiny. ” It’s take civil courage to be involved in politics… and laws cannot protect you from nasty phone calls or nasty letters …” Justice Scalia wrote. 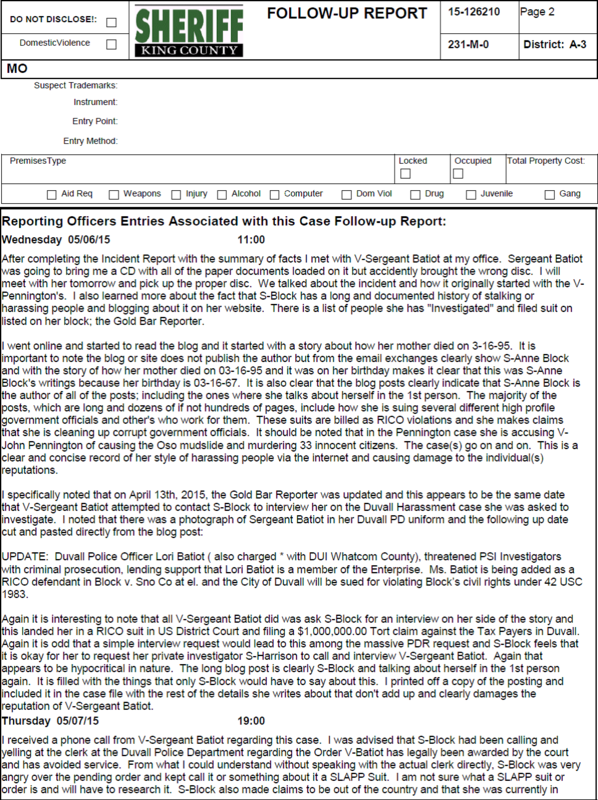 Below is a story published by another news reporter here in Snohomish County about corrupt Duvall police officer Lori Batiot’s little racketeering crimes against us for reporting the news on John Pennington, Crystal Hill Pennington ( nee Berg) criminal racketeering conduct. Knowing what we know 1.5 years later, this article below, now makes sense why a corrupt cop from Duvall and John Pennington tired so desperately to SLAPP down our messages. Their little racketeering crimes of trying to SLAPP down messages have now lead to at least six prosecutors being sued for racketeering and five government officers being tossed by the voters in the last five years. Thankfully, two judges tossed their corrupt acts as a prior restraints on free speech, the Honorable Judge Smith, King County Shoreline District, basically called Lori Batiot a liar and corrupt. At least someone attorneys are honorable. Free speech is never criminal, if it were, America would be renamed ” The Communist States of America.” In fact, it’s the only tangible item that separates other countries from America. The First Amendment is what makes America great. My right to redress a government official, who is being paid with our tax monies, it’s called ” redress” and our RCW makes it clear that any such attempts to SLAPP down our messages holds a $10,000.00 per offense penalty, not to the government but to the corrupt person who tried to attack our message. John Pennington’s conduct in the Oso mudslide disaster speaks for itself as does his diploma mill online flat fee degrees Senator Tom Harkin called fraud. Pennington’s conduct herein speaks for itself. A person who communicates a complaint or information to any branch or agency of federal, state, or local government, or to any self-regulatory organization that regulates persons involved in the securities or futures business and that has been delegated authority by a federal, state, or local government agency and is subject to oversight by the delegating agency, is immune from civil liability for claims based upon the communication to the agency or organization regarding any matter reasonably of concern to that agency or organization. A person prevailing upon the defense provided for in this section is entitled to recover expenses and reasonable attorneys’ fees incurred in establishing the defense and in addition shall receive statutory damages of ten thousand dollars. Free speech issues are never criminal unless You physically threaten someone. For people out blogging or reporting news on corrupt government gang stalkers like John E. Pennington, Crystal Hill ( owners of the Sky Valley Chronicle, a foe online site set up to defame and stalk anyone who dares expose John Pennington’s criminal racketeering conduct) always either blind cc or cc someone else in on your emails when approaching “gang stalkers” like John E. Pennington. 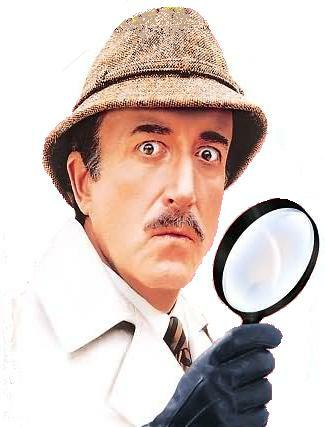 I don’t know why but in reading the new public records I keep hearing the theme song from the Pink Panther and seeing the bumbling Inspector Clousteau, the only difference is that this is real, not some silly movie or cartoon. I’m not sure if King County Sheriff Cary Coblantz has been watching too many spy movies or if he was trying to get a little something with Sgt Batiot. He has taken far more then any professional interest in Batiot and this case, to the point of being absolutely inappropriate. Why is he driving Ms Batiot to court? Does she not know how to drive (sober) or is he using this as a way to get a little too close. Evidently he also hasn’t done much investigating of anything, he just take Batiot’s word about anything she says and what officer doesn’t know what a SLAPP suit is? Maybe if he would’ve actually read further he could’ve figured it out. Domestic spying on a US Citizen, a law abiding, tax paying citizen should scare the crap out of everyone. This also explains why the DOJ has never stepped in to combat or control the corruption in Snohomish County. They are just as guilty if not more of abuse of authority against it’s very own citizens. This was not a matter of National Security, this was a civil, not criminal matter, this is against the law. This sadly is our own Government abusing it’s authority. With the recent hackings of so many companies and govt branches what if someone else got a hold of Ms Block and Mr Frederick’s personal info? Info they had no legal authority to share. I believe it was Mike Carter from the Seattle Times who called Anne Block delusional, said she was making up the fact that her personal info was being shared by Interpol and that she was being tracked, said she was just plain wrong because stuff like that didn’t happen…. 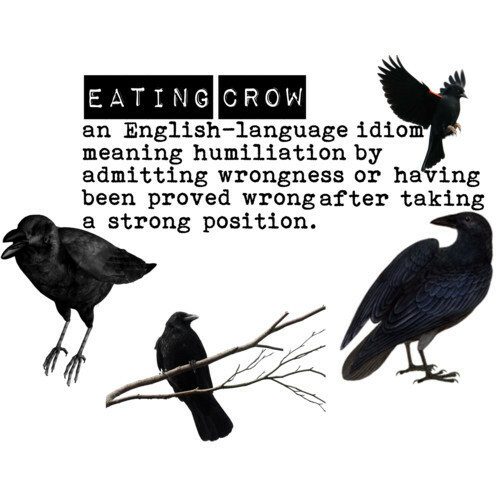 I’d think he might like to issue an apology to Ms Block because as the saying goes “Crow pie is a lot easier to eat while it’s warm” but this is not the first time that these reporters have discounted Ms Block’s assertions and been 110% absolutely wrong. Comment by Gold Bar Reporter, how this story, 1.5 years later, now makes sense. Inspector Clousau, King County Sheriff’s Officer, Cary Coblantz, you might look harder on my site because it’s clear that the Gold Bar Reporter has a section published titled “about me.” Now, I’ve investigated your criminal racketeering enough to know Mr. Coblantz that you don’t have a college degree, and from the looks of the police report you either failed “Police Civil Liability” or King County failed in its training, because First Amendment protected speech is NEVER criminal especially when it’s matters of public concern involving public officials, unless you threaten someone’s life. In case my readers aren’t clear on why Sno County Reporter posted the emails, it’s because soon after I started requesting Lori Batiot’s email communication, she panicked and attempted to obtain a restraining order against me for reporting on her little racket of not pressing criminal charges against Pennington ( noting she was engaged in an affair with him for years and had no business investigating a single complaint made against him by anyone, but we discovered five complaints in Duvall that had Batiot’s signature is on the bottom of the incident report and in each case she found that there was insufficient evidence to pursue her dear friend John Pennington for criminal harassment, and in one complaint Crystal Hill threatens us with a gun and throws a Blackberry device at a Duvall police officer). 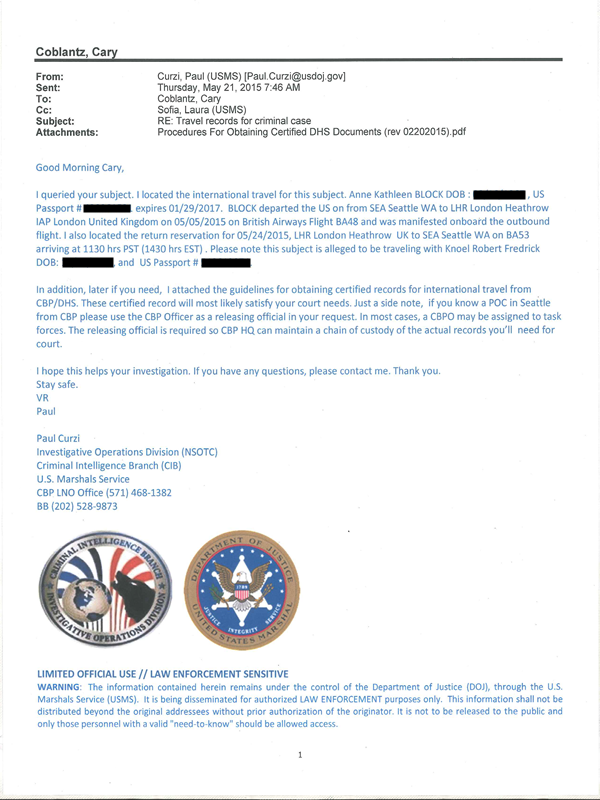 In May 2015, while traveling with my partner from London Heathrow Airport to Seattle Tacoma International Airport, corrupt police officer Lori Batiot and King County Sheriff Cary Coblantz lied to the Department of Justice Interpol claiming I was wanted back in the US for a felony warrant with extradition back to the US. No such warrant ever existed and both Lori Batiot and Cary Coblantz are being sued for gross 1983 violations, and violating my right to be free from illegal search and seizures in violation of the 4th and 14th Amendments. RCW 40.16.010, Injury to public record. Ignorantia juris non excusat or ignorantia legis neminem excusat (Latin for “ignorance of the law excuses not” and “ignorance of law excuses no one” respectively) is a legal principle holding that a person who is unaware of a law may not escape liability for violating that law merely because he or she was unaware of its content. But hey wait, Washington State’s Attorney General’s dream team of lawyers from Christie Law Group had already been cited for the same criminal conduct of destroying records. Intentional destruction, you be the judge. Snohomish County Daily Herald reporters Noah Haglund and Scott North appear to be doing a little less brown nosing with Snohomish County Prosecutors’ these days, in favor of subjective news reporting. On August 24, 2016, Scott North and Noah Haglund published an article that the Washington State Attorney General’s Office was intentionally destroying evidence in the Oso mudslide trials. However, what Scott North and Noah Haglund failed to tell Snohomish County readers was that several prosecutors, Sara Di Vittorio and Miquel Tempski, were moved from Washington State Attorney General’s Office to Snohomish County’s prosecutors office to help conceal public records involving the man solely responsible for the Oso mudslide , John E Pennington. Oh yes, Sister Sara, w all know how expensive it is when government deceives and commits crimes against it’s people.” But wait, isn’t your job monitored by the WSBA mandating that you not commit crimes? Or did you not know that tampering with public records in Washington is a felony. Now, because of the Attorney General’s conduct captured so nicely by the Oso plaintiff’s attorneys, we now know what Sister Sara Di Vittorio was referring to, also known as tampering with public records to reduce liability. Mr. Pennington plead guilty to criminal assault 1 and harassment ( Washington County Case # D911027SC made to pay restitution) after he hospitalized his fiancé in Oregon. The spoliation of evidence is the intentional, reckless, or negligent withholding, hiding, altering, fabricating, or destroying of evidence relevant to a legal proceeding. Spoliation has two possible consequences: in jurisdictions where the (intentional) act is criminal by statute, it may result in fines and incarceration (if convicted in a separate criminal proceeding) for the parties who engaged in the spoliation; in jurisdictions where relevant case law precedent has been established, proceedings possibly altered by spoliation may be interpreted under a spoliation inference, or by other corrective measures, depending on the jurisdiction. The spoliation inference is a negative evidentiary inference that a finder of fact can draw from a party’s destruction of a document or thing that is relevant to an ongoing or reasonably foreseeable civil or criminal proceeding: the finder of fact can review all evidence uncovered in as strong a light as possible against the spoliator and in favor of the opposing party. The theory of the spoliation inference is that when a party destroys evidence, it may be reasonable to infer that the party had “consciousness of guilt” or other motivation to avoid the evidence. Therefore, the fact finder may conclude that the evidence would have been unfavorable to the spoliator. Some jurisdictions have recognized a spoliation tort action, which allows the victim of destruction of evidence to file a separate tort action against a spoliator. I say subjective news reporting because Scott North and Noah Haglund have ample evidence as stated herein but only seem interested in reporting on Attorney General Bob Fergusson’s criminal conduct. But NBC and CBS appear to be investigating John Pennington …. Stay tuned as John Pennington’s criminal conduct is about to become very public. Hugs and kisses Linda Eide and Lin O’Dell as Your little racketeering outfit also known as the Washington State Bar is about to be abolished and we have a child/ wife abuser named John E. Pennington and his bank frauding wife Crystal Hill Pennington ( nee Berg, convicted of bank fraud 2000 and 2005), who, in a roundabout way, helped make that happen. Respondeat superior (Latin: “let the master answer”; plural: respondeant superiores) is a US legal doctrine which states that, in many circumstances, an employer is responsible for the actions of employees performed within the course of their employment. The way I view Bob Ferguson’s actions, he’s responsible. The Rules of Professional Conduct also make Bob Ferguson responsible for the conduct of those he supervises. But those silly rules are only applied against those who criticize the Washington State Bar Association. Gross violations of Sherman Anti-Trust, felonious conduct. By the time our investigation is over, the feds will have people in handcuffs inside the Washington State Bar just as they did to the Arizona Bar a few years back. Filed Under: John E. Pennington TERMINATED from Snohomish County after public records reveal he is guilty of racketeering, redmond-pd1_Page_1, Washington State Attorney Bob Ferguson Recall after records reveal his office was destroying public records, Washington State Attorney General intentionally destroying public records, claim we're attorneys sworn in to uphold the law but we didn't know it was a felony to destroy records in Washington State, D, Washington State's Attorney General's dream team of lawyer from Christie Law Group had already been cited for the same criminal conduct of destroying records Tagged With: A new Qui Tam suit for fraud will be filed in Washington D.C. Federal District Court after public records reveal that Crystal Hill and John Pennington have frauded FEMA Emergency Management out of $29, Bob Fergusson Washington Attorney. General destroying records, Christie Law Group caught destroying public records, Christie Law Group shady conduct here in Washington State, DEM John E. Pennington, Governor Jay Inslee allows Attorney Generals office to destroy evidence. to cover up criminal comduct of John E Pennington made who caused 43 people to suffocate to death als o man resposnible for the, John E Pennington trying push his fradulent online diplomia to State of Virgina, John E. Pennington, John Pennington, John Pennington former DEM Snohomish County redmond-pd1_Page_1, John Pennington tries to fraud State of Virgina with his fraudlent crimianl conduct, NBC investigaigng. fraud comitted by John Pennington, Oso mudslides. 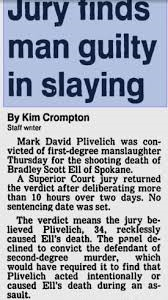 cicitms frauded by Bob Fergusson WA AG, Sky Valley Chronicle runned by man who caused 43. deaths in Oso john. pennington., Snohomish County Prosecutors Sara Di Vittorio and Miquel Tempski. destroying. public records on behald of Bob Fergusson Attorney General, WA AG Recall to be filed if he gets reeletced, Will State of Virgina hire man guilty of criminal harassment also man who caused 43 people to suffocate to death in Oso mudslide trials? 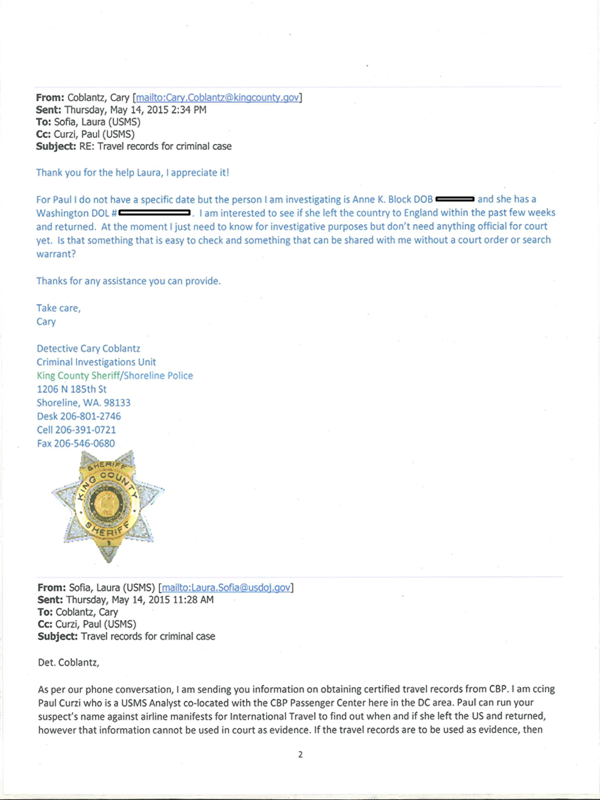 Did Sky Valley Chronicle’s agent Ron Fejfar send electronic threats to harm Gold Bar Reporter? Ron Fejar agent of Sky Valley Chronicle sends the below electronic threats after public records reveal he is posting internally false articles with actual malice. Fejfar has never denied a single allegation. However, if he cares to comment further with his name attached, we’d be happy to post his comments. Public records from Snohomish County Washington document that terminated former Director of Emergency ( fired after he caused 43 people in Oso mudslides to suffocate to death) is a posting articles on Ron Fejfar’s site. Last week, Fejfar made several telephone calls to the Gold Bar Reporter’s relatives in New England falsely stating that the Gold Bar Reporter was being sued for defamation and he needed to know where the Gold Bar Reporter was to serve her. 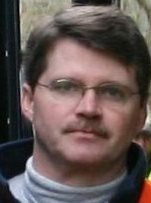 In July 2014, we learned that former Snohomish County political appointee John Pennington had been in direct contact with attorney Lin O’Dell’s convicted killer boyfriend Mark Plivilech, which we suspect to cause harm. Further records from Snohomish County emails document that John Pennington also used Steve McLaughlin to stalk the Gold Bar Reporter at her home ( July 2014 emails from Snohomish County). Steve McLaughlin is running for Washington State Public Lands Commissioner. John Pennington and Fejfar are being sued for Racketeering in US Federal Court, with a new deceptive trade and slander/defamation complaint coming this week. Depositions against Fejfar and John Pennington expected to start in January 2017. We do not know for a fact what person or persons is behind this email threat or other similar threats like it this company has received in recent months and years. But let us be clear about one thing to whoever is behind this. Should any further warrantless, harassing and retaliatory in nature legal actions of any kind be forthcoming against this newspaper and/or our corporation and/or individuals associated with this enterprise, or other actions of any kind which would lead to further harm to our business or individuals associated with it in any way, our intent is and has been for some time to launch a blistering and unrelenting counter suit against a Snohomish County individual and a minimum of six of this individual’s well known supporters/associates/sycophants who have been involved with this individual over an extended period of time in efforts clearly designed to damage our business. $600,000 in damages will be sought from each defendant for a variety of documented, planned, coordinated long term attacks that have violated the civil rights of, and severely damaged in numerous ways individuals associated with the business and the business enterprise itself as a result of ongoing, organized business and individual harassment as well as business interference and contractual interference, to name just a few offenses that have damaged this company and individuals associated with it. Illegal actions that have resulted in a loss of business and personal income, damage to stature and reputation in the community, future earnings and other damages. It is also our intent to extend an offer to other individuals in the greater community, and there appear to be many, who feel they too have been harmed in numerous ways by this same ongoing, coordinated group conspiracy of harassment, intimidation, business interference and character assassination to join us in our quest for justice. Suggest you advise associates of what may be forthcoming in their lives. Would be unfair to these individuals to first learn of this from a process server while mowing their lawn on a weekend or while at work on a Friday afternoon. No need to respond to this for no further response on this matter will be forthcoming. As for the Sky Valley Chronicle’s threats to sue us, we welcome that chance, as he will soon have an opportunity to pursue his threats above. Promise.